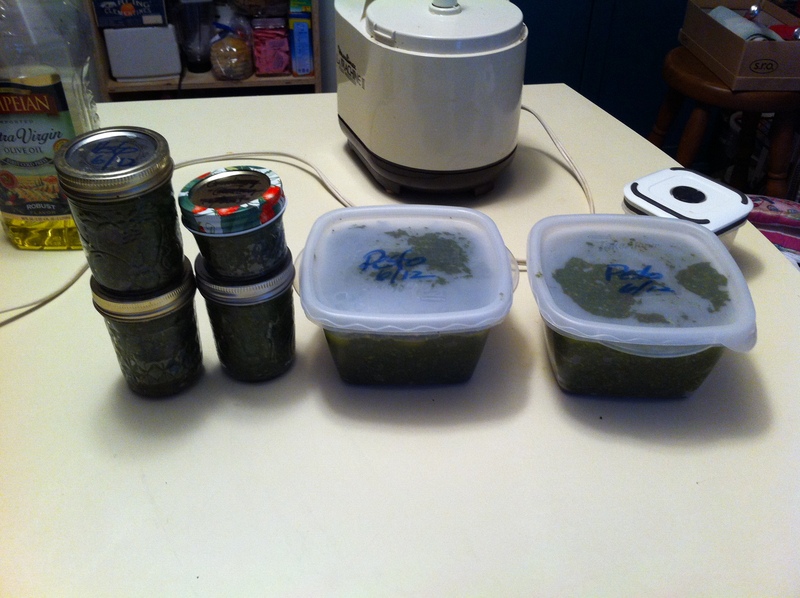 I spent my day making pesto. Every summer I make pesto. I grow 12 or 15 basil plans of different variety. Mostly plain sweet basil, but I also always add lemon and lime basil, Thai basil, purple basil and lettuce leaf basil. Sometimes I use spicy globe basil, but the leaves are so small it’s hardly worth it. 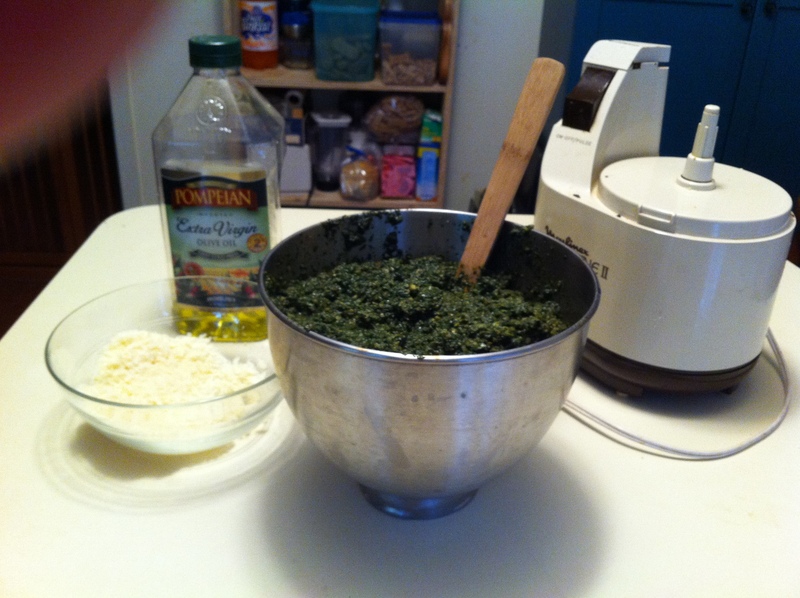 I try several times over the summer to make pesto. It’s a luxury to have a great store of it. It makes a nice last minute gift, I supply slave drew at his house with pesto, and there is absolutely always pesto in the fridge and the freezer both. I add it to lasagne, mix it in with red sauce, add it to garlic bread, etc. So, I chronicled my basil day, because I felt like it. I clipped an enormous armload of basil about 1pm. It all needed to be clipped back, anyway, so it will bush out and not get leggy or bolt. It took a while to clip it all, and I had so much it was hard to carry it all in easily. I spent the next three hours clipping the leaves off the basil into bowls. I usually do it by hand, pinching them off with my thumbnail, but that invariably leaves a semi-permanent stain on my finger and thumbnail, so this year I actually clipped them off, one by one. I made a couple of phone calls while I worked, then watched something on Netflix. 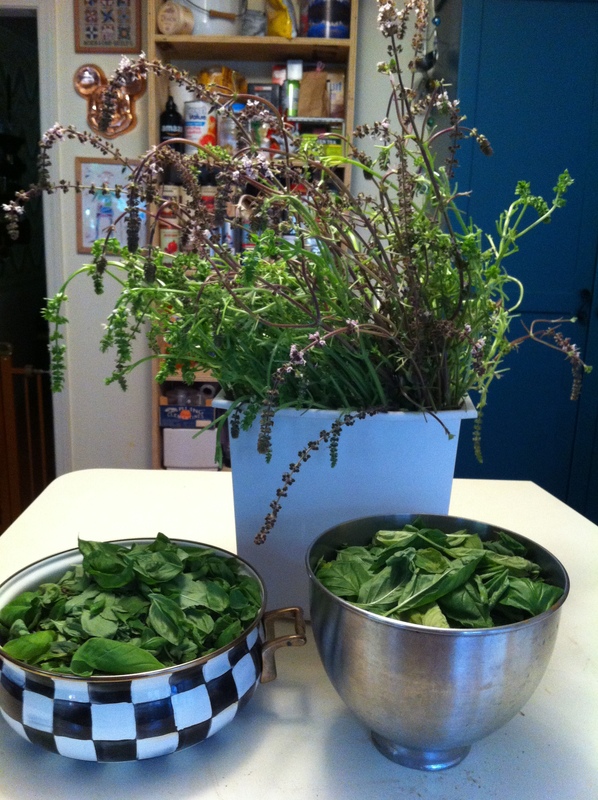 Finally, I had a container of the stems I had denuded, and two large bowls of basil leaves. Large bowls, packed full, pushed down and flattened as much as possible. After the leaves are plucked, the rest is not so time-consuming. 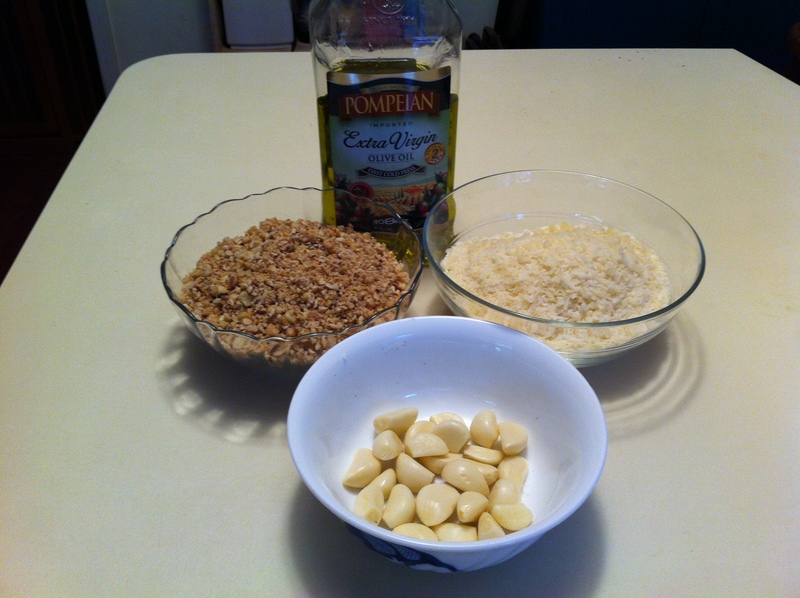 I grated Romano cheese, the grated a lot of different nuts, which I really prefer. Walnuts, blanched almonds, a few pecans, macadamias and the traditional pine nuts. I pulverize the garlic, too, with some olive oil. I use a LOT of garlic. By a LOT of garlic, I mean about 20+ cloves. I like garlic. Keeps the vampires away. I have so much basil that it’s not possible to process it in one batch, so it took three. 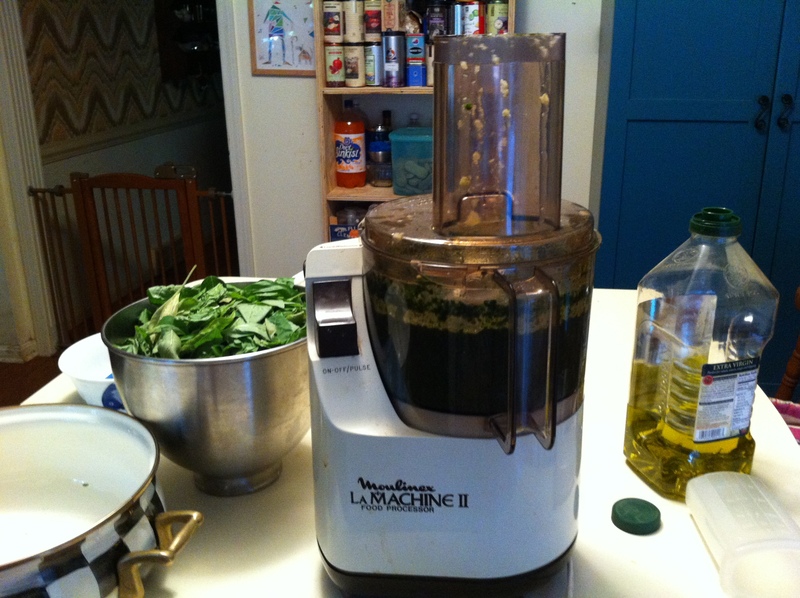 Basil leaves in the food processor, add olive oil, keep processing until it’s a finely chopped. I mix about a third of the garlic, which is also processed until it’s nearly smooth, with each batch. I add nuts and the cheese as I go, but I worry less about that not being precisely blended. A ribbon of garlic, however, would not be good. Then it all gets mixed together in a big bowl, all of the batches together. I had a bit of cheese left over, and some olive oil, but all the rest went into the pesto. Then I packaged it for the freezer. I had a fair amount. That might not, in retrospect, seem like a lot, but bear in mind, a serving of pesto is perhaps a tablespoon or so. Bear in mind, too, that I’ll do this two or three times more this summer. Now, I’m not sure why I felt compelled to provide nearly a cooking lesson. I am a good cook, for the record. I’m a decent baker, though I can’t make pie crust to save my life. I can’t make fudge, either, if it’s not done in a microwave. I like making pesto, or, rather, I like having made it. I don’t love the process, though I do find it meditative in some ways. You clip and clip and clip and clip the leaves off. You cut up the cheese and grate it, you grind the nuts. At first, the entire house smells of basil. You have great armfuls of it, after all. Then it smells of garlic. I pureed, you’ll recall, 20 plus cloves. That’s a fair amount of garlic. Then it begins to smell like pesto, the combination of the basil and the garlic and the cheese and the nuts and the oil. Ms Tammy came by after work to drop something off to me, and we talked for a while, which we haven’t done in a bit, at least not the two of us alone. When she left I gave her a jar of pesto. I got a text a little bit later that one of her slaves was, and I quote, “freaking out,” over the pesto. This was, I was assured, a good freakout. So, apparently, it was, indeed, a productive day.